Family Rosaceae Juss., genus Rosa L.
Rosa ciliato-sepala Blocki, R. sosnovskyi Chrshan., Rosa caucasica Pall., Rosa lutetiana Lem., Rosa taurica M.Bieb., Rosa arguta Stev. ex M. Bieb. Sprawling shrub 1-3 m height (annual plant reaches 20-30 cm height, biennial - 50-60 cm, 15-20-years - 2.5-3 m), branchy, not thick, often with arcform branches. Bark green or red-brown; grey for old shoots. Root system deep, strongly branching. Plant makes numerous roots offshoots. Spines are sparse, 5-6 mm length, extended at the base, compressed with sides, falciform, very rare erect, straw-colour, disseminated by shoot, on the main shoots they often set in pairs or whorled. On the shoots going from the bush base spines are smaller and usually more abundant. Leaves 5-11 cm length, odd-pinnate, with 5-7 leafles. Leaflets mostly elliptical form; 1.5-6 cm length, green, acuminate on the top, acute-serrate, with heart-shaped or rounded base, naked with both sides. Stipules 1.5 cm length and 2 mm width. Flowers in 2-4-flowers corymb, rare alone, pale-pink or white sometimes bright-pink undouble-flowering , 4-8 cm diameter. In the time of deflorated brightly-pink spot by the base of petal is well noticeable. Sepals wide-lanceolate, till 25 mm length, early fall off, after blossom they facing down and crowded to the fruit. Peduncle 1-1.5 cm length. Fruit - hip consists from numerous (about 16) nutlets enclosing in flashy gipantii locking after clossom. Fruit 1.5-2.6 cm length, naked, ovoid, ovoid-elliptical, rare spherical, glabrate, by mature bright orange-red. Average weight of fruit 1.7-3.2 g, exit of the flesh - up to 70.8%. Flowering in June, fructification in August-September. Cultivated in the middle and central regions of European part of the former USSR, in the Crimea, Middle Asia, the Caucasus, the Middle Ural, in Western Siberia. In wild condition grows on the margins of the forests, on the slashes, in lighted forests, on the banks of the rivers, streams, likes. Cultivated as early as 12 and 13 centuries in the gardens of Russia (Kiev, Moscow) as ornamental and medicine plant. Well grows on the light, fertile, deep, no much sandy-loamy soils, with enough aeration. No bear heavy loamy and stone soils. pH 5.5-6.5. Badly develops on the salinized soils. Best temperature for growth 15-22°C. Photophilous, frost-resisting plant. Fruits accumulate much quantity vitamin C, carotene, organic acids. Medications from fruits used in medicine as cholagogue. Plant used as a stock for other species of the cultural roses. Ornamental plant for green plantation. Honey plant. Akimov P.A. & Bulygin N.E. Trees and shrubs of the arboretum and park of Leningrad Forest-Technical Academy. Leningrad: LTA, 1961. 109 p.
Frolova T.V. Roses. Sorts, breading, grow in the open and closed soil. Rostov-na-Donu: Feniks, 2000. 128 p.
Griner B.M. Trees and shrubs usefulness for cultivate in open soil Europe part of USSR. Issue 1. Moscow: MOLMI, 1960. 129 p.
Ishchenko L.E. Species of the genera Rosa L. of the Turkmenistan flora introduced in Central Botanical Garden of Academy of Sciences Turkmenia SSR // Ornamental plants for landscape gardening of Turkmenistan. Issue 9. Ed. I.S. Gaevskaja. Ashhabad: Ilim, 1986. P. 90. Nemudrov A.I. Culture of the roses in Turkmenistan // Ornamental plants for landscape gardening of Turkmenistan. Issue 9. Ed. I.S. Gaevskaja. Ashhabad: Ilim, 1986. P. 90. Nomerov B.A. Culture of roses. M.: Moskovskii universitet, 1965. 221 c.
Shishkin O.K. Test of the roses in the conditions of the Middle Ural // Bulletin Main Botanical Garden. Issue 106. M.: Nauka, 1977. P. 38-42. Sviazeva O.A. Dog Rose - Rosa canina L. // Atlas of areas and resources of medicine plants of the USSR. Moscow: GUGK, 1983. p. 330. Tkachenko V.I. Middle-Asia Dog-Roses introduced in Botanical garden of Academy of Sciences of Kirgizskaja SSR. Frunze: Ilim, 1986. 94 p.
Vasil.eva O. Ju. 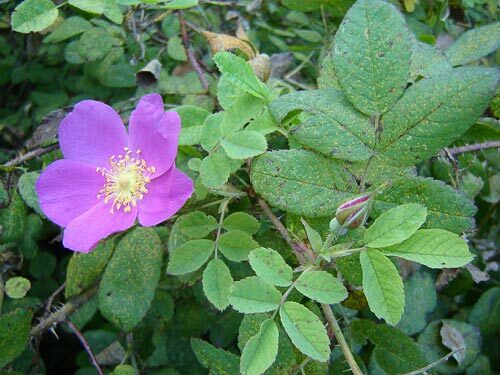 Test of Rosa canina as a stock in Western Siberia // Bulletin of the Main Botanical garden. Issue 198. M.: Nauka, 1988. P. 48-51. Vorob.eva M.G. Boulevard of town Frunze // Introduction of trees, shrubs and fruit plants in Kirghizija. Bishkek: Ilim, 1991. P. 33-41. Zinovskis R.E. (ed.) Botanical garden of academy of science Latvia SSR 1956-1981. Riga: Zinatne, 1983. 325 p.
Zinovskis R.E., Bize M.A., Knape D.A. & Kucheneva G.G. (eds.). Conspectus of dendroflora of Kaliningrad region. Riga: Zinatne, 1983. 162 p.